Glenn Billing scores a shorthanded goal to put Phantoms 6-4 ahead against Sheffield. Photo: �2018 Tom Scott. All rights reserved. Peterborough Phantoms are one game away from a historic quadruple. The city side booked their place in the NIHL Final Four showpiece thanks to a high-scoring semi-final triumph in Coventry tonight (April 13). 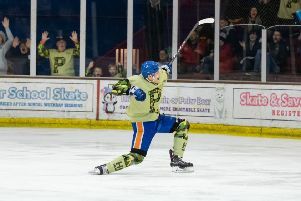 Glenn Billing (on back) celebrates the first of his two goals for Phantoms against Sheffield. Photo: �2018 Tom Scott. All rights reserved. Slava Koulikov’s treble heroes, who have already won the NIHL Autumn Cup, the NIHL South Cup and the NIHL Division One South play-offs, saw off NIHL Division One North runners-up Sheffield Steeldogs 9-4 in a thriller at the Skydome Arena. And they will now return to the same ice later today (April 14) when facing Hull - who have completed a league and play-offs double in the North - in a battle for overall glory (5pm). The Pirates saw off South runners-up Bracknell 6-2 in the other semi yesterday. “It’s fantastic to be through to the final,” said Koulikov. “And I’m sure it will be a great occasion. “It’s been a wonderful season that we will all remember for a long time and we are still fighting for silverware in the very last game. James Ferrara scores for Phantoms in their 9-4 win over Sheffield. Photo: �2018 Tom Scott. All rights reserved. “We know we’re going up against a very good team who have lifted two trophies. They are stacked offensively and also very decent defensively. Phantoms certainly didn’t have it all their own way against the Steeldogs in a game where they only gained full control in the final period when going on a five-star scoring spree. Earlier they fell behind when Sheffield import Adrian Palak struck from behind the net in the closing minute of a tense first period. But the shackles well and truly came off in the middle session when they the two teams with the best defensive records in their respective divisions shared seven goals. Admittedly Sheffield were without their first-choice netminder Dimitri Zimozdra due to suspension. An equaliser from Glenn Billing was followed just 66 seconds later by a Corey McEwen effort as Phantoms turned the game only to be pegged back by Ash Calvert on a powerplay. The frantic action continued as Will Weldon briefly restored the Phantoms advantage before Steeldogs import Milan Kolena produced a terrific solo strike to level again. And the teams then traded powerplay goals as Martins Susters’ effort was cancelled out by Sheffield player-coach Ben Morgan as they headed back to the dressing rooms locked together at 4-4. But the final period was all about Phantoms as they stormed to victory with five unanswered goals to book their place in the final. It was only 51 seconds old when Weldon helped himself to his second of the evening and Billing followed suit when netting in a short-handed situation to stretch the advantage. Susters then became the third Phantoms forward to strike for a second time before captain James Ferrara got in the act with little more than four minutes to go. And the city side’s progress into a first final since their 2015 success in the English Premier League was already assured by the time young talent Jarvis Hunt completed the scoring with 47 seconds left on the clock. Koulikov added: “It was pretty even in the first period when there were maybe a few nerves in such a big game on a big stage. “We got better in the second period when the two early goals gave us a lift. “The guys played with a bit of freedom and we won the period even though we conceded a couple more than we would have liked. “There wasn’t much wrong with our performance so I didn’t feel I had to shake the guys up ahead of the third period. “We knew that if we corrected a couple of things tactically we could tighten up and we were also confident we would continue to get chances. “It was very calm in the room. We discussed what we needed to do and the guys did what was asked of them. “We managed to get back in front and the short-handed goal to make it 6-4 was a big moment in the game. And now Phantoms need to produce one more big performance to provide a perfect ending to a stunning season against a Hull side they beat home and away in the group stage of the NIHL Autumn Cup back in October. Phantoms won 2-1 at Planet Ice after penalty shots and then claimed a 6-5 verdict in the return clash.